Genoa is home to the Acquario di Genova, which is the second-largest aquarium in Europe and the best in Italy. Built in 1992, it welcomes more than 1.2 million visitors each year. The ship-like building on the promenade houses no fewer than 50 habitats, ranging from the Amazon basin and Red Sea coral reefs to Antarctic penguin pools. Hundreds of species that call the aquarium home include seals, dolphins, caiman, piranhas, jellyfish, sea turtles, and sharks - the penguins are very entertaining and are particular favourites with visitors. 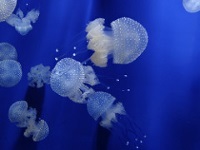 The aquarium is extremely well-maintained and has good English-language facilities. It is a fantastic family attraction in Genoa, and gives kids a fun break from traditional sightseeing. Unexpectedly, the aquarium also has a hummingbird sanctuary. Due to its popularity the aquarium can get crowded in the summer months and it is a good idea to arrive early to avoid queuing. There have been complaints about scams and petty theft outside of the aquarium - the most commonly reported scam involves salesmen tying bracelets tight onto visitors wrists and then demanding payment once they cannot be removed. These hawkers are sometimes just a distraction so watch out for pickpocketing.